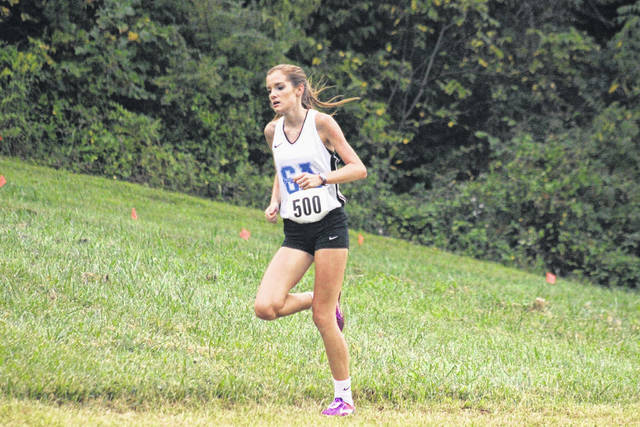 Gallia Academy sophomore Brooke Johnson runs in the Coach’s Corner Invitational on Sept. 5 in Centenary. 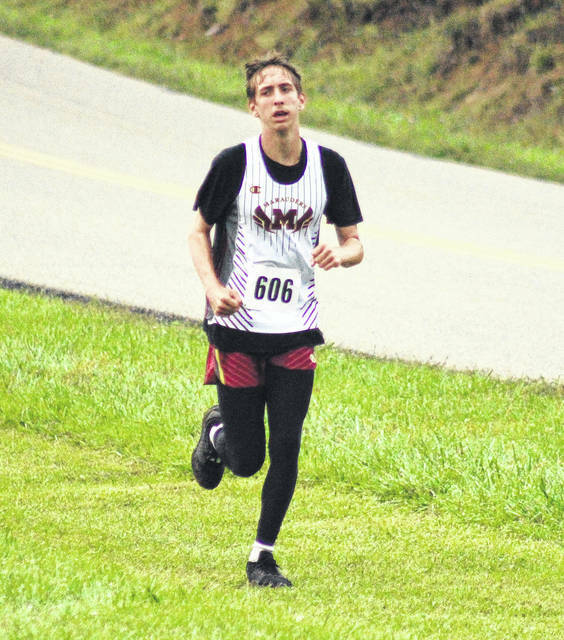 Meigs sophomore Colton Heater runs along the road during the Coach’s Corner Invitational on Sept. 5 at Gallia Academy. RIO GRANDE, Ohio — This time, the River Valley High School boys cross country squad was on the right end of a ninth-place finish. That’s because the Raiders, missing by a single spot last season, have punched their ticket to the Division II regional meet — after landing the final team qualifying slot from Saturday’s Southeast District meet at the University of Rio Grande. In addition, Gallia Academy advanced two senior twin brothers — and one standout female freshman on an individual basis. Unlike past years, when there were two Division II races for both boys and girls, Saturday’s district meet featured one large race for the boys and one large race for the girls. This was actually the second season for that to take place. However, eight clubs from last year’s meet reached the regional, as Gallia Academy clipped River Valley by eight points for that eighth and final qualifying bid. This year, the Raiders return to the regional after advancing two years ago, as the top nine squads qualified for this year’s meet — to take place on Saturday at Pickerington North High School. But even this season’s team standings were tightly-packed from seventh thru 12th-place, as River Valley —with a team score of 285 — edged out Fairland (290) for ninth. Miami Trace (294) and Zane Trace (304) were also within 20 points of the Raiders. There were 27 total teams in the boys meet, as Gallia Academy (464) ended up 16th and Meigs (813) 27th. Leading the way for the Raiders was senior Nathaniel Abbott, who crossed the finish line in 18th overall in 17 minutes and three seconds. For Abbott, he is now a three-time regional meet qualifier — and was the Raiders’ only individual to advance last year. The remaining Raider scorers included senior George Rickett (48th in 18:00), senior Kyle Coen (55th in 18:09), junior Rory Twyman (78th in 18:42), junior Cole Franklin (95th in 19:17), junior Caleb McKnight (103rd in 19:25) and sophomore Austin Livingston (107th in 19:30). Gallia Academy seniors Caleb Greenlee and Kyle Greenlee also qualified, and in fact finished in the exact same spots as they did a year ago — in 20th and 25th respectively. Both Greenlees were members of the Blue Devils’ regional group last fall, as Kyle Greenlee reached the regional individually as a sophomore. This year, Caleb Greenlee completed the 5K course in 17 minutes and 17 seconds, while Kyle Greenlee was just six seconds behind him. From a year ago, the Greenlees improved their respective times by 11 and 10 seconds. The next Blue Devil to cross was freshman Tristan Crisenbery (132nd in 20:10), while senior Kobe Cochran (153rd in 21:20), senior Ezra Blain (154th in 21:20), senior Ethan Rider (155th in 21:20) and sophomore Logan Blouir (156th in 21:21) all finished within three places and one second of one another. Meigs fielded five runners, which included Colton Heater (143rd in 20:44), Christian Jones (157th in 21:34), Cole Hoffman (182nd in 24:15), Joseph Cotterill (184th in 24:22) and Brandon Justis (187th in 24:55). On the girls side, freshman Sarah Watts was 13th for Gallia Academy, and was the only Ohio Valley Publishing area girl to advance. Watts completed the distance in 20 minutes and 31 seconds, as the overall winning time was an even 19 minutes. The Blue Angels almost advanced as a team, but placed ninth with a score of 278. The top seven girls teams qualify in Division II, as Waverly was the seventh squad with a tally of 239. There were 16 girls schools which posted team scores, including 12th-place River Valley with a 291 and 15th-place Meigs with a 372. The top 28 individuals advance, as Blue Angel sophomore Brooke Johnson almost joined Watts at the regional —placing 33rd in 21:43. Gallia Academy’s other five scorers were junior Abby Cremeans (80th in 25:24), sophomore Abby Johnson (83rd in 25:49), senior Cassidy Starnes (90th in 26:10), freshman Maddie Stewart (102nd in 27:00) and sophomore Grace Montgomery (103rd in 27:00). The Lady Raiders, which qualified for the Division III regional as a full team last season, were led by senior Kenzie Baker (34th in 21:43) and freshman Hannah Culpepper (40th in 21:59). The remaining River Valley scorers were Josie Jones (63rd in 23:57), Akari Michimukai (67th in 24:06), Julia Nutter (108th in 27:35), Lexi Stout (111th in 28:08) and Natosha Rankin (112th in 28:08). Meigs fielded five runners, which included Caitlyn Rest (64th in 23:58), Madison Cremeans (65th in 24:01), Taylor Swartz (85th in 25:56), Ariann Sizemore (91st in 26:10) and Carmen Doherty (96th in 26:34). Visit www.baumspage.com for a complete list of results of the 2017 Division II Southeast District meets.